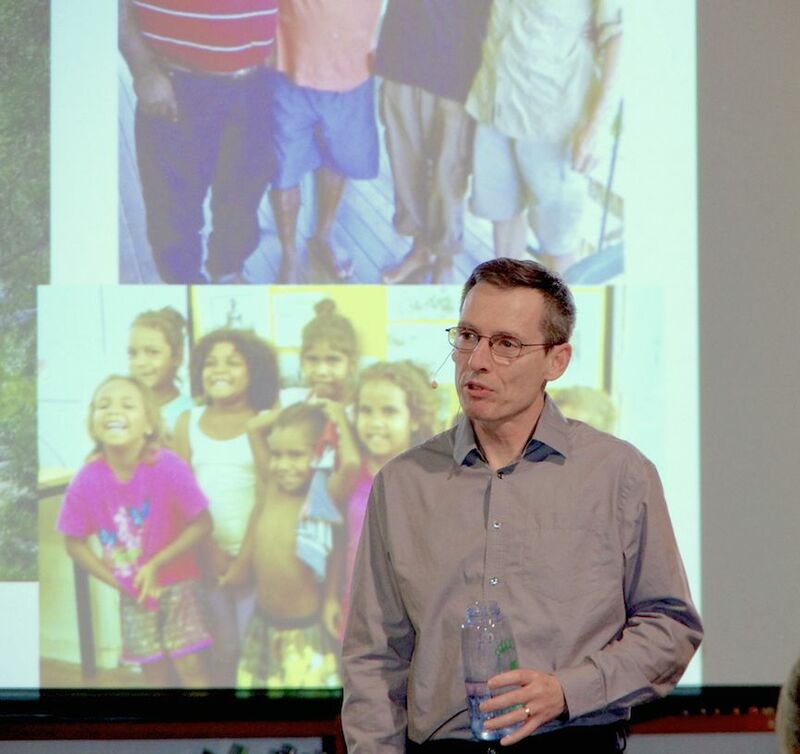 As an award-winning journalist and author of “Your Water Footprint”, winner of Best Science Book for the General Public, I’ve given dozens of talks and presentations on environmental issues including water, climate, energy, biodiversity and more. In the midst of a successful corporate career I changed direction to pursue my growing interest in writing, science, conservation and the environment. Over the past 20+ years I’ve written more than 2000 articles on science and environmental topics around the world for National Geographic, the Guardian, New Scientist, IPS, and many more. For some of this work I was fortunate enough to receive the prestigious Prince Albert/United Nations Global Prize for Climate Change and Environment Reporting. 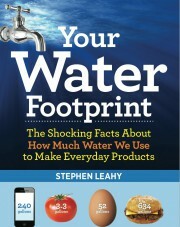 In late 2014 my first book was published: Your Water Footprint: The Shocking Facts Behind Our Thirst for Earth’s Most Precious Resource. Reviewers called the book “brilliant and shocking” and “exceptionally lucid”. And then it won the award for best science book in Canada. I’ve done presentations for all ages and backgrounds including kindergarten kids and scientists in California, journalists in South Africa, public officials in Spain, general public in Idaho, teachers and business executives in Toronto. For more info please use this contact form. Walrus Talks Water — Victoria, B.C. To contact me please use this contact form. 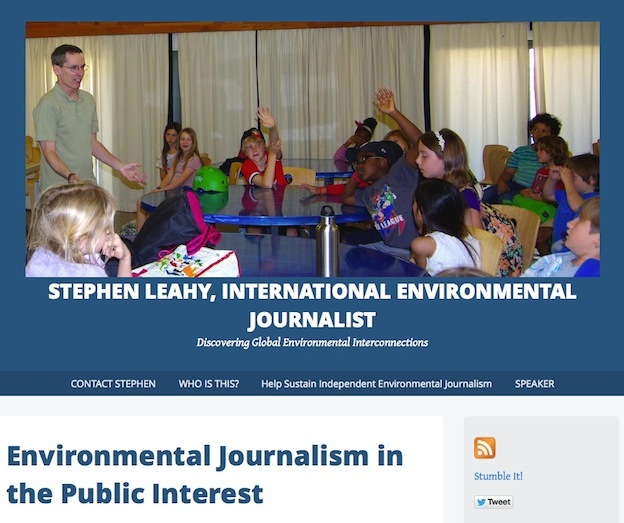 Stephen has been an independent journalist for over 20 years and has reported on environmental issues from dozens of countries. He has been published in many leading publications around the world including National Geographic, New Scientist, The London Sunday Times, The Guardian, Vice Magazine, Al Jazeera, Maclean’s Magazine, Earth Island Journal, DeSmog Canada, The Toronto Star, Wired News, China Dialogue, Mo Magazine (Europe), TerraGreen (India), and Common Dreams. Based near Toronto, he is also the senior science and environment correspondent for the Rome-headquartered Inter Press Service News Agency (IPS), the world’s largest not-for-profit global news agency. IPS articles are published in over 500 newspapers and magazines all over the world reaching an estimated 200 million readers in up to 20 languages. IPS news is also broadcast by over 1000 radio stations, potentially targeting over 150 million listeners. Stephen also contributes to IPS affiliates in Montevideo, Johannesburg and New Delhi. His journalism also appears on a wide range of news networks including Reuters AlertNet, DeSmog Blog, TerraViva, InfoSud, Rabble.ca, Common Dreams and more. Prior to journalism, Stephen had a successful career in the private sector. He is currently a Fellow at the International League of Conservation Writers and professional member of the International Federation of Journalists; Society of Environmental Journalists. A co-winner of the 2012 Prince Albert/United Nations Global Price for Climate Change and Environment Reporting. Hundred’s of Stephen’s articles are freely available on his main website. These cover topics ranging from climate change to food production to nano tech.